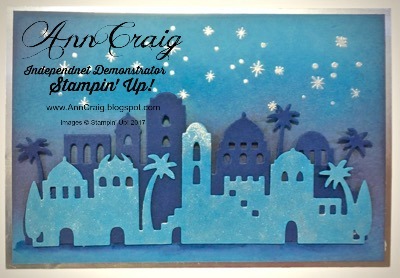 Ann Craig - distINKtive STAMPING designs - Stampin' Up!® Australia: NIght in Bethlehem in Silver Foil and Blue. NIght in Bethlehem in Silver Foil and Blue. This is the final card we made for my Night In Bethlehem card class. I particularly like this one because of the colours used. Marina Mist and Perfect Plum sponging on Marina Mist card stock set the scene behind the die cut city. The city has been die cut with the Bethlehem Edgelits Dies, and I've used Night of Navy card for the distance and Marina Mist for the front. I used Clear Wink of Stella over the Marina Mist buildings and heat embossed the stars with Silver Embossing Powder and my Stampin' Up Heat Tool. Don't you love how you can make the Wink of Stella highlight parts of your images by adding more or less of it? The Marina Mist card front was matted onto Silver Foil and then onto Thick Whisper White card. You can see the list of products used below. I hope you enjoy the card and if you need any of these products you can order them on-line by selecting the product in the list. It will take you directly to my shop and your order will be sent directly to you.